salted caramel sauce. 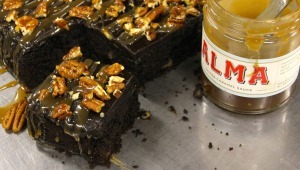 It's easy to make, and satisfies that caramel chocolate craving! Preheat the oven to 350oF. Grease a 7”x 12” pan. Cream the butter, vanilla and sugar together. Gradually add in the eggs, while beating. In another bowl, mix the rest of the dry ingredients together. Slowly fold in this flour mixture. Pour it out into the pan and fill out the corners. Bake in the oven for 45 mins, or until an inserted toothpick comes out clean. Cool on cooling rack for at least 30 minutes before frosting. Mix the cream, powdered sugar and cocoa powder till smooth.